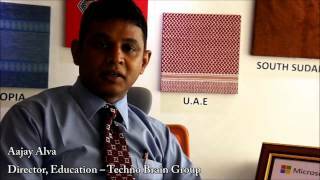 Techno Brain, in their journey towards success, believes in a philosophy that is inclusive and progressive. This philosophy is richly reflected in the Techno Brain Foundation. A not-for-profit undertaking, it was founded with contributions from employees, directors and company profits. Its sole purpose is to empower the disadvantaged to take their rightful place in the African growth story — a story that can peacefully co-exist with the environment. The story of the underprivileged has to be re-written; poverty has to be eradicated; healthcare and education must be mandatory. The Foundation would like to do the rewriting — as many stories as they can. The Foundation’s program identifies young men and women who have academic potential, and provides the required support system to keep them on the track to success. It empowers children by providing them with an opportunity to grow. A 10-acre campus with the best possible learning environment across varied business disciplines is one of the first steps the Techno Brain Foundation plans to take towards the realisation of these goals. It plans to leverage resources, facilities and personal contributions made by Techno Brain’s global network and partner organisations. In Techno Brain’s pursuit of growth and opportunity-creation for the people of Africa, the Foundation appreciates the responsibility and duty it has towards preserving the environment. In association with other environmental organisations, Techno Brain Foundation will plant 200,000 trees over the next three years. The Foundation has also offered their technical expertise to assist organizations involved in protecting the welfare of wildlife — ensuring biodiversity for the generations to come. With a number of projects in the pipeline, and a vision for Africa firmly in place, Techno Brain is all set to pave the way for sustainable development by empowering the nation’s youth. Our Capacity building programs and Impact Sourcing initiative form some of our Youth Empowerment activities. Knowledge Transfer: Techno Brain maintains a mutually collaborative relationship across various organizations, educational facilities and the public sector that helps enhance economic growth. Some of our academic advisors & partner programs are Microsoft for Africa, SAP Skill for Africa, Kenya Government driven ICT literacy among others. Academic Alliance: Techno Brain seeks to establish centers of excellence at prestigious institutions of higher learning across Africa. The focus of the centers will be to offer for the first time in Africa, high end ICT training in the areas of banking, insurance, finance, marketing and human resources, using the latest state-of-the-art ICT equipment and technology tools. Innovation: Techno Brain is committed to finding new and sophisticated methods of providing products and services to customers that would continue to increase our revenue exponentially. Educational Funding: Partnering with various financial institutions, Techno Brain provides assistance in loan applications that will essentially assist students to be able to take various courses offered by the company. Internship and Job Placement: By setting up and partnering with various centers of education, Techno Brain has been able to provide ICT certifications, mentorship, internships and subsequent employability by developing and sustaining students’ ICT talent. Impact sourcing is a responsibility of the business community which plays a key role in providing sustainable employment to youths on a global scale, thereby improving the livelihoods of youth and providing them with better opportunities. Techno Brain has aided several grantees of Rockefeller Foundation including Samasource, World Vision US, Child Helpline Kenya among others. We have partnered with Samasource on some projects in order to equip people who come from poor backgrounds with some essential ICT skills. We have also partnered with various NGO’s to help promote Impact Sourcing by providing assistance in a range of areas such as Trainers and strategic consultants.